Q: When is a building not a building? A: When it's a light fixture. 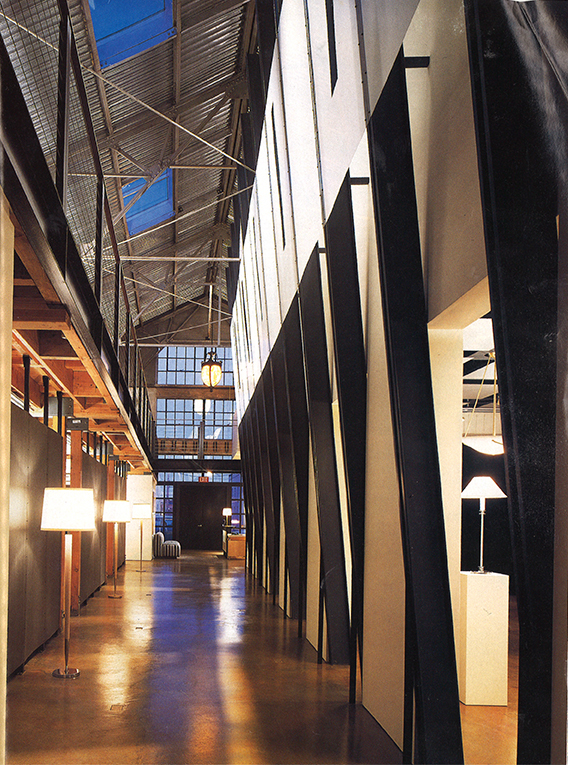 I was organizing a filing cabinet at Boyd Lighting's headquarters in Northern California when I came upon a 1996 October issue of Interior Design Magazine. Not sure whether I should recycle or file it away, I cracked open the yellowed cover. As I thumbed through the publication, with whom Boyd has a 40 year history, I was amused by design trends like oversized, upholstered chairs in primary colors and leopard print rugs. Then I stopped. Page 126. It was 944 Folsom. 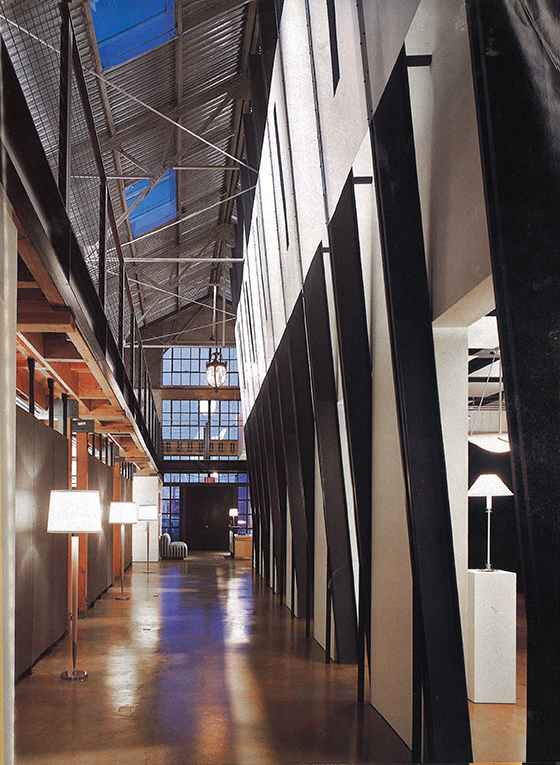 "944 Folsom", as it is lovingly called by long-standing Boyd employees, was Boyd Lighting's San Francisco office/studio/showroom from 1996-2012. And it was a design masterpiece. Visitors to the part of San Francisco known as South of Market have no doubt seen the Boyd building at 944 Folsom Street and stopped to admire its concrete facade enlivened with glowing cobalt glass squares set in a tidy grid. But this is just the beginning. Inside is 11,000 sq. ft. of lighting effects which combine Boyd's past with it's present. According to the article, this is not a building, but a light fixture. 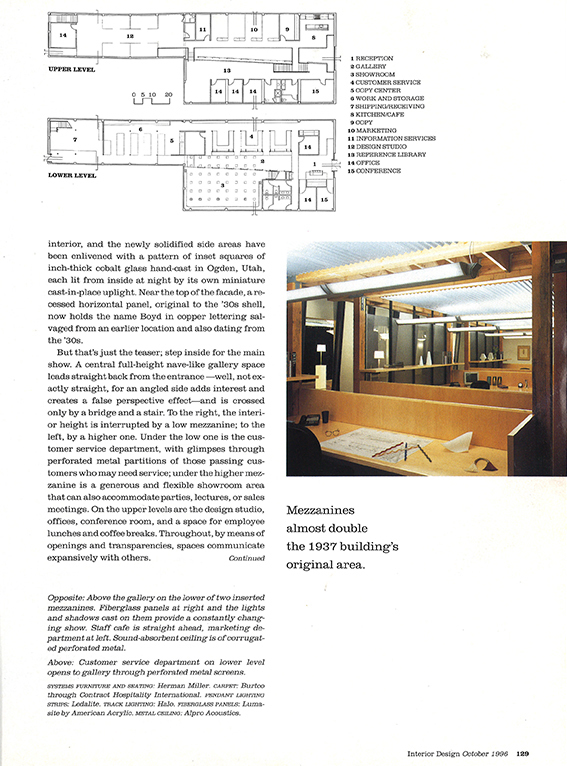 I had heard about 944 Folsom and the remarkable vision of the design firm principal Richard Brayton, project designer David Darling, showroom design consultant Michael Vanderbyl and our CEO, Jay Sweet. (The work on this building cemented long-lasting relationships that would lead to future partnerships and lighting designs by all three.) I would be remiss to not mention the lighting designer Chris Ripman, the structural engineer Steven Tipping of Tipping Structural Engineers, and the general contractor Uwe Dobers of European Fine Construction. In the article entitled "Sweetness and Light," author Stanley Abercrombie explains the many ways light is manipulated throughout the space. 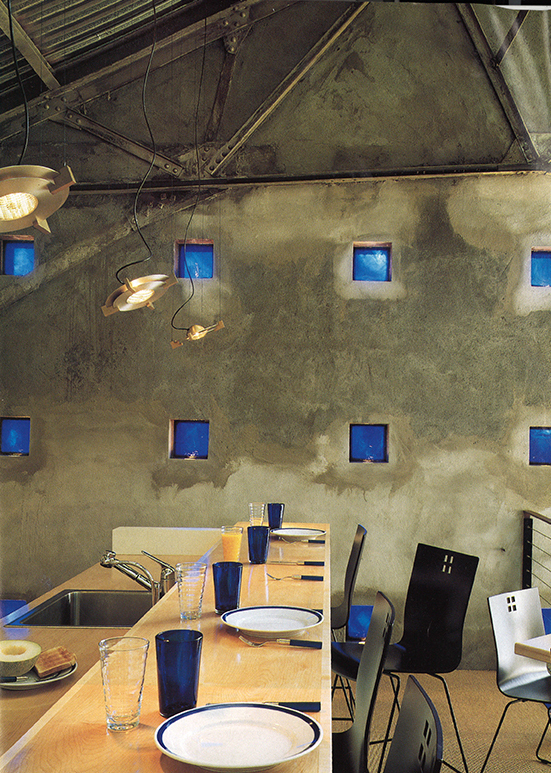 The facade's thick blue glass cubes hand-cast in Ogden, Utah are illuminated from the inside with individual uplights. Angled fiberglass panels provide a constantly changing show of light and shadows, manipulating light during the day by diffusing that which enters from skylights, and then glowing at night with projected light. And modern Boyd fixtures hang amidst antiques from Boyd's historic venues like the Pantages Theater, San Francisco Opera House and Honolulu's Iolani Palace. I enjoyed learning about the infamous 944 Folsom, and it makes sense that it is filled with such creativity, ingenuity and history... just like Boyd Lighting itself. You would expect it from a company that has been around since 1921. If you find yourself in the area, be sure to snap a photo of the building and tag us. We would love to see it.